The structure is, on the whole, the same as in the foregoing species. The strange, peculiar, strongly convex central part is, however, wanting (the disc is homogeneous) and the margin is furnished with numerous strong spines which are almost regularly distributed. Shape of the shell in side view: Broadly linear (the disc is of almost even thickness) but little narrower at the margin that in the middle, with sharp or obtuse corners, not clearly rounded off at the ends, but almost square. There are short spines scattered on the central part. The system of rings: From the innermost little shell 4 radial rods extend in the shape of a cross to the first ring, as in the preceding species. The ring itself is also here an irregular quadrangle with rounded corners. Outside this ring, there are three others, connected to each other by radial rods whose number increases outwards. In the prolongation of the 4 primary radial rods (from the inmost shell) May be seen, more or less clearly, some similar ones which are rather crookedly placed, and these conjoin to form 4, more or less definite, zigzag rods, which go through the whole system of rings. On the outside ring there are numerous (21) equatorial, narrowly conical, marginal spines. Pores: The pores in the centre are very small, punctiform, very scattered with wide intermediate spaces, gradually larger outwards, on the two outer rings about 2 on the space between the rings, uneven in size, up to 4µm or a little larger. Between the pores on the central part very small, punctiform byspines are scattered, which may easily be overlooked. Radial spines: Numerous, narrowly conical (subulate), Strong radial spines of different lengths, the longest being little more than 1/2 of the radius of the disc. Some project out from the ring next to the outside one, several too from the one next to the inmost one, and yet a few from the innermost one. Byspines: A few scattered ones, very short and very small, needle shaped, extend from the central part of the disc. Dimensions: The diameter of the inner shell 14µm, of the first ring 34µm, of the second 60µm, of the third 84µm, of the fourth 102µm. In thickness 24µm. The specimen illustrated appears to be almost fully developed. Probably only the small portion of the outer ring which is not seen in the illustration, is all that is wanting. This species exhibits a certain amount of agreement with S. stellata BAIL., which has, however, fewer and broader spines, and also differs in other respects. Only once found: Sea off Röst, 22/3 1899, 0-900 m. (together with the preceding and the following species). Stylodictya validispina Jørgensen, 1905, Bergens Mus. Sknifter, p. 119, Pl. 10, fig. 40. Stylodictya aculeata Jørgensen, 1905, op. cit., pp. 119-120, Pl. 10, fig. 41. Stylodictya polygonia Popofsky, 1912, Deutsche Südpolar Exped., vol. 13, pp. 131-132, Pl. 5, fig. 3. Test consisting of two, parallel, flat, latticed sieve-plates, circular in outline, supported internally be numerous (9 or more in fully developed forms) latticed rings perpendicular to the plates, generally arranged concentrically around the central shell or ring, in a few specimens having a spiral arrangement. Central region of test not composed of concentric discoidal shells; therefore, test appears flat or slightly biconcave in side view (text-fig. 11) and central area not darkened in surface view. In side view. innermost ring appears as a spherical to subspherical shell; in surface view it appears as a ring, quadrate in outline. Four mutually perpendicular beams in the plane of the disc arise from the inner ring or shell and extend to the first ring beyond, in most specimens dividing the latter into four quadrants, each consisting of a convex outward curve. The second and third rings also quadrate in outline in most tests; the outer rings are generally circular. Rings all separated by equal distances (10-20 µm); therefore, test consists of concentrically or spirally arranged chambers whose walls consist of the latticed rings and the parallel latticed plates. Chambers pierced by numerous, regularly arranged, cylindrical beams, most of which are discontinuous, occupying one or just a few of the chambers, few (1-4) continuous to the center ring or shell; more beams are added with the addition of each outer chamber. Beams of outermost chamber do not extend as free spines in several specimens; in many specimens they extend as equal, thin, conical spines of variable length and number (15-40). Pores of the two parallel latticed sieve-plates circular to subcircular, subequal in size, arranged regularly in concentric rows, 2-5 per chamber. Surface of test generally smooth, in a few specimens with short thorns. Measurements; based on 30 specimens from stations 27, 46, and 81: diameter of apparently fully developed specimens 160-246 µm; diameter of outermost complete ring (third to ninth ring) 80-246 µm; diameter of center ring or shell 11-16 µm; length of marginal spines 10-60 µm. Remarks. No specimens were observed with a small-pored, rounded margin with a single pylome as in Ommatodiscus pantanellii and Ommatodiscus sp, although, it is possible that none of the Gulf specimens are fully developed. 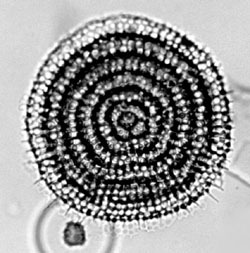 A few specimens were observed with the outermost concentric circular chamber having slightly smaller pores and a thinner wall than the inner chambers, thus giving the appearance of a fully-developed form; in these types most of the radial beams within the last chamber do not extend beyond the margin as free spines, but a few of them do; therefore, technically, these forms belong to Stylodictya Ehrenberg. Other forms have long, thin, conical, radial spines extending from beams within the last-formed chamber; these forms appear to be fully developed, but other specimens have a greater number of circular chambers and appear to be incomplete. The radial spines, if present, are not robust but are thin and conical; they are variable in length and number, and in many specimens they are absent. Jørgensen (1905, p. 119) states that the difference between Stylodictya validispina and S. aculeata is that the latter has more numerous radial spines which are more irregularly placed, not all lying at the same level but pointing obliquely beyond and beneath the level of the disc. Because forms corresponding to both of Jørgensen's species were observed from the Gulf, and because the writer could find no basic differences between them, they were placed in synonymy. Both are characterized by the four, mutually perpendicular, radial beams arising from the inner shell and by the first to second or third rings being subquadrate in outline. The central region of the test is flat, without concentric discoidal shells. S. tenuispina Jørgensen (1905, pp. 118-119) differs from the above species in the presence of a biconvex central area which is presumably composed of concentric discoidal shells. S. polygonia Popof ky agrees well with the Gulf species in the equally spaced concentric rings, pores of the latticed plates, and thin marginal spines. Certain of Haeckel's species are similar to some of the Gulf forms of this species. Those without radial marginal spines but apparently with concentric rings, not discoidal shells, in the central region include Porodiscus flustrella Haeckel (1887, p. 1193, Pl. 41, fig. 1), P. perispira Haeckel (1887, p. 495, Pl. 41, fig. 2), P. quadrigatus Haeckel (1887, p. 494, Pl. 41, fig. 3), P. centrospira Haeckel (1887, p. 495, Pl. 41, fig. 6), P. irregularis Haeckel (1887, p. 498, Pl. 41, fig. 7), Trematodiscus orbiculatus Haeckel (1862, p. 492, Pl. 29, fig. 1. ), and Discospira helicoides Haeckel (1862, p. 514, Pl. 29, fig. 7). Those similar to the above but with thin, conical, marginal, radial spines include Stylodictya heliospira Haeckel (1887, p.512, Pl. 41, fig. 8), S. multispina Haeckel (1862, P. 496, Pl. 29, fig. 5), and Stylospira dujardinii Haeckel (1862, p. 515, Pl. 29, figs. 9, 10). Without reference to the type material of these species, placement of them in synonymy would be tentative. Numerous specimens of this species from the Gulf have a spiral rather than concentric arrangement of rings. This is also characteristic of other discoidal species in the Gulf and appears to be variable among individuals within a species. Distribution. This species is rare at all stations in the Gulf except at 64 where it is common (2.0%) and at stations 194, 203, 206, 208, and 214 where it is absent. Its greater frequency at station 64 may be explained by upwelling in this region. Except at stations 95 and 151 where it is present in slightly greater numbers, its distribution in the remainder of the Gulf does not undergo any significant fluctuations. It has a slightly greater frequency in the southern Gulf, but because it occurs as far north as stations 191 and 192 it is nearly cosmopolitan but with greater affinity for Pacific oceanic waters. Both of Jørgensen's species were reported from the North Atlantic off the coast of Norway. Popofsky reported his species from the equatorial Atlantic. Haeckel's species listed in the remarks above were reported as either cosmopolitan or from the central Pacific or Mediterranean Sea. This species, therefore, may be cosmopolitan, occurring at all latitudes, but further taxonomic work on this group is needed before its world-wide distribution can be determined. Skeleton in form of flat disk not thickened in middle. Central round chamber distinctly visible; around it four chambers of approximately equal dimensions arranged in form of cross. These surrounded by others, usually larger in dimensions, disposed in more or less regular concentric rings; sometimes arrangement of chambers somewhat disturbed and zigzag seam present that may be regarded as proof of their spiral growth. Concentric rings of chambers number 5-6; their width hardly increases to periphery of disk. Pores on walls of chambers irregular, usually 2-2,5 pores located at width of one ring (i.e. third pore disposed in middle of seam between chambers of neighboring rings). Pores on peripheral rings somewhat larger than those on central. Growth of shell proceeds by successive growth of chambers around margin of disk. Adjacent rings pierced by radial pieces, some of which extend from margin of disk as radial needles. Apart from these, radial needles not connected with the radial pieces arise around margin of disk. Radial needles arranged very irregularly, number 12-16 along periphery of disk with five rings (most frequently broken off to base). Dimensions: diameter of central chamber 12-15µm, diameter of first ring 30-35µm, diameter of second ring 55-60µm, of third 80-85µm, and forth 110-115µm, diameter of disk with five rings about 140µm.